The Internet of Things (IoT) is an adventurous branch of tech that has flung us into a new era, infinities beyond just the internet. According to a recent McKinsey report, the next decade will see IoT shoot up in worth to as much as US$11 trillion. It is also predicted to drastically transform industries like agriculture, health, and transport. IoT is opening up a whole new world – and it has already started evolving. It is no longer just about smart fridges reminding us to buy eggs and smart sneakers telling us how many calories we’ve burnt – there are Tesla cars that use big data to predict demand and update their operating systems remotely, there are clever buoys that alert lifeguards to sharks, there are even sensor networks called Pips, that help dementia sufferers maintain independence. Believe it or not, ‘things’ are getting even more interesting, let’s take a look at the average modern-day factory… Just like our homes, manufacturing facilities these days are technology hubs. There are electronic controls, sensors, and automated equipment, all interconnected to form a highly efficient production force. These links and intersections between people and machines, tools, and systems are opening up a new field of development which Jason Prater of Plex Systems has cleverly described as The Internet of Making Things. As manufacturing plants produce more and more products, productivity in factories continues to rise. The tools and machines that are connected to this production are vital to its efficiency. For example, an Internet Protocol (IP) torque wrench that forms part of an assembly line. It captures the torque that is applied, the last time it was calibrated and which employee used it. This information is sent via the cloud so that every part affected can be quickly identified. Automation like this decreases downtime and makes it possible for a larger variety of products to be produced faster. Flexibility and programmability have been around for several years, but the Internet of Making Things, which involves sensors, connected devices, and cloud computing is relatively new – and it is very exciting. It's answering the need for customization, incorporating wearable tech in manufacturing systems, and bringing people and processes together to create a new ecosystem that can take production and productivity to the next level and increase added value. Technology and environmentalism are not usually terms used in the same context. But even though tech brings to mind mass production and mass waste, increased power consumption and increased pollution, it is not all bad for the earth. Technology could actually be the key to saving the world - if it is used in the right way. A great example of this is drone technology. Some would see drones as toys for children (and big children…) but these gadgets are not only there for entertainment. Professional drones are used for an increasing variety of environmentalist tasks and recent developments in drone technology are helping scientists tackle major challenges. 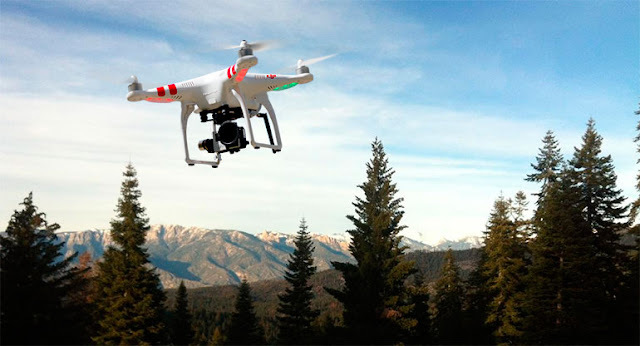 Aerial imaging can give environmentalists detailed geographic data making previously out of bounds areas accessible – no matter how harsh the terrain is. Data gathered by the drones are used in areas like the Himalayas where the melting rate of glaciers is being monitored, and the migration of animals is tracked. This important information is giving environmental scientists incredible insights into the complexities of our ecosystem and is equipping them to do their work which ultimately benefits the entire planet. Besides tracking environmental changes passively, drones are also valuable tools in aiding conservationists. Damien Mander, the founder of the International Anti-Poaching Foundation, is advocating using drones to combat elephant poaching in Africa, and several national parks in African countries like Kenya have already consented to using this technology. Drones can also help when environmental disasters strike and teams need to get to affected communities without maps. Instead of risking human lives in assessing damage in forest fires, drones can be used to assess the situation safely from the air. With this accurate information, cautionary measures can be implemented and risk areas can be evacuated. Environmental and conservation efforts around the globe are already benefiting from the technological advancement of drones, and this is only the start of it. It will be exciting to see how different groups will be using drones to help save the planet in the future.